TREATMENTS ARE DONE BY REGISTERED ACUPUNCTURIST. As general acupuncture is integrated into the treatment, receipts can be submitted to extended medical health plans with acupuncture coverage. Complete health history, face/skin analysis, Chinese Medicine diagnosis and recommendations. This session will also determine if you are qualified for a TARGETED (1 or 2 areas of concern) treatment or a FULL treatment. Includes a consultation, full Facial Rejuvenation acupuncture, massage/acupressure (face, scalp, neck and upper shoulder). Packages – ask us about payment options. Includes a consultation and acupuncture treatment targeting a specific area of concern (chin & jawline, naso-labial groove & lips, furrow & eyebrows, forehead, eyes). 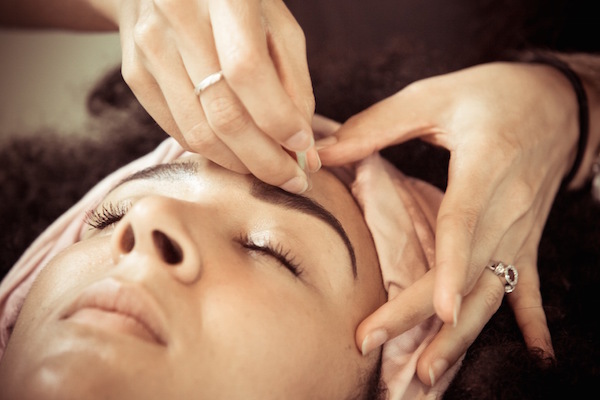 Uplevel your facial treatment with expertly applied cosmetic acupuncture to address expression lines, acne or acne scarring, and stimulate collagen synthesis to naturally rejuvenate the skin. A needle-free treatment that provides similar benefits as cosmetic acupuncture; Facial cupping follows the same overall techniques and theories as body cupping and yet it’s designed to target head and face to treat various conditions or simply used for relaxation. The bonus is, it doesn’t leave harsh bruises on your face. Why opt for Cosmetic Acupuncture? Developed according to the principles of Chinese medicine, Facial Rejuvenation works in harmony with the natural energy systems of the body. It re-educates facial muscles and addresses the underlying causes of visible aging. Facial Rejuvenation is a natural alternative to cosmetic procedures such as facial surgery, BOTOX COSMETIC®, chemical peels and dermabrasion. Sensitive areas like the eyelids and the lips can be safely treated with cosmetic acupuncture, whereas the aforementioned therapies cannot treat wrinkles on these delicate and fragile areas. A single treatment offers temporary tension relief and softening of expression lines. For optimal lasting results a series of 6-12 treatments done once or twice a week is recommended. Following maintenance treatments are recommended to keep results lasting longer. Click here to learn more about the extensive benefits of Cosmetic Acupuncture.